Take advantage of our yearly SmileGuard discount plans! Options are available for both children and adults. Eliminate stains and achieve a naturally white smile. We offer different options to suit the needs and budget of every patient! The Smile Center of Rochester offers strong and beautiful dental restorations for your smile including crowns, bridges, and metal-free fillings. Whether you’re a waitress, a parent, a business person, or lawyer–everyone deserves to feel great about their smile. With our unique smile design process, instead of hiding your smile, you’ll soon be flashing a gorgeous Hollywood smile! Feel like you, only better. Are you embarrassed of your smile or want to look and feel younger? Our full mouth rehabilitation process helps us restore function to your smile, allowing you to chew more comfortably, smile more, and speak with confidence. You’ll even look younger too! How long has it been since you or your partner have enjoyed a restful, snore-free night of sleep? Those who habitually snore may actually be suffering from a disorder called sleep apnea, which can lead to a variety of unpleasant symptoms and is easily treated by your dentist. Trust us–we know most people would rather be anywhere but the dentist. Because of this, our goal as your Penfield dentist is to put you at ease, making you feel as comfortable as possible during your time with us. Whether you’re calling in with questions, checking in at our front desk, or receiving treatment in one of our state-of-the-art operatories, we strive to go above and beyond in treating each patient with one-on-one personalized attention and care. From regular hygiene cleanings to teeth whitening and mini-dental implants, you’ll be happy you chose The Smile Center of Rochester for your dental care. The Smile Center is not a volume based drive-thru-dental-clinic. You will not see a different face or different hygienist at every visit. Rather, we are a friendly group of dental professionals whose focus is on providing superior patient care. We truly enjoying getting to know all of our patients on a personal level and aim to build relationships with you by having you see the same team members each time you visit. As a team, we have more than 110 years of combined dental experience, translating to excellent quality dentistry for you and your entire family. In addition, we attend dental conferences, study clubs, and take continuing education courses throughout the year to keep us even more up-to-date on our craft. Dr. Sanon himself attends close to 150 hours of continuing education courses each year! Like medicine, dentistry is ever-changing. We stay on trend with the latest dental equipment, materials, and technology. Being on the cutting-edge of dentistry allows us to provide you with the best dental care available today. Both you and your smile will benefit from it! At The Smile Center of Rochester we provide affordable, honest, quality dentistry. Our patients needs comes first – even before our own. You will never feel ignored or rushed here. Become part of our dental family– Contact The Smile Center of Rochester today! 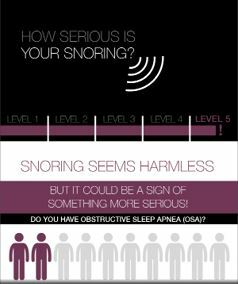 Download our FREE infographic and learn how snoring can pose a serious health risk to you or a loved one. You can get your download HERE.